An artist's impression of our Milky Way galaxy, a roughly 13 billon-year-old 'barred spiral galaxy' that is home to a few hundred billion stars. On the left, a face-on view shows the spiral structure of the Galactic Disc, where the majority of stars are located, interspersed with a diffuse mixture of gas and cosmic dust. The disc measures about 100 000 light-years across, and the Sun sits about half way between its centre and periphery. On the right, an edge-on view reveals the flattened shape of the disc. Observations point to a substructure: a thin disc some 700 light-years high embedded in a thick disc, about 3000 light-years high and populated with older stars. The edge-on view also shows the Galactic Bulge, located in the central portion of the Milky Way and hosting about 10 billion stars, which are mainly old and red. The bulge, also visible in the face-on view on the left, has an overall elongated shape that resembles that of a peanut-shaped bar, with a half-length of about 10 000 light-years, making the Milky Way a barred spiral galaxy. Beyond the disc and bulge is the stellar halo, a roughly spherical structure with a radius of about 100 000 light-years, containing isolated stars as well as many globular clusters – large, compact conglomerations of some of the most ancient stars in the Galaxy. 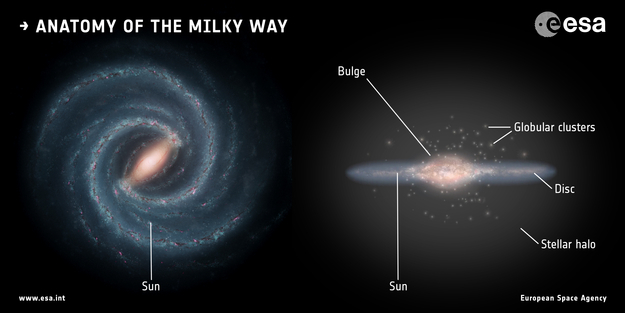 On a grander scale, the Milky Way is embedded in an even larger halo of invisible dark matter.